by the 30 licensed life insurance companies in the Philippines. I only found one insurance company that sells this kind of a product. various kind of products that caters to your individual needs. 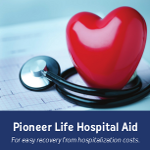 What I like about this product called "Pioneer Life Hospital Aide"
children and you will be paying just one premium. will pay you P1,500 per day of confinement. that by P1,500 in case this is the amount of your daily benefit. only for the 7 days you stayed in the hospital. with a higher daily benefits. How much is the monthly premium you might ask?